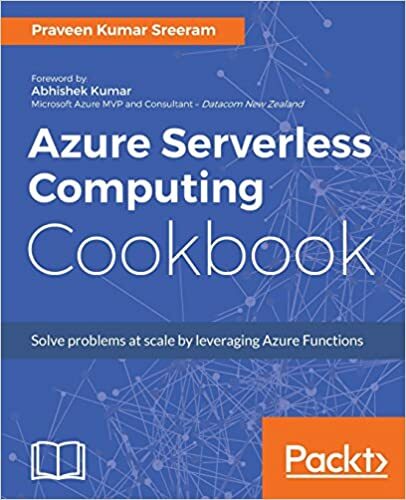 In a few of our previous articles (listed below), we have already discussed how to create Azure App Service. However, we didn’t discuss anything about the App Service Plan that we have associated with each of the App Services. An App Service plan represents a set of features and capacities that you can share across multiple apps in Azure App Service including Web Apps, Mobile Apps, Logic Apps or API Apps. 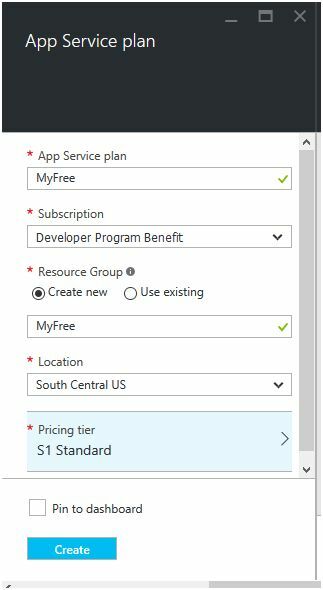 ( Reference- Azure App Service plans in-depth overview ). Let’s first see how to create the App Service Plan. 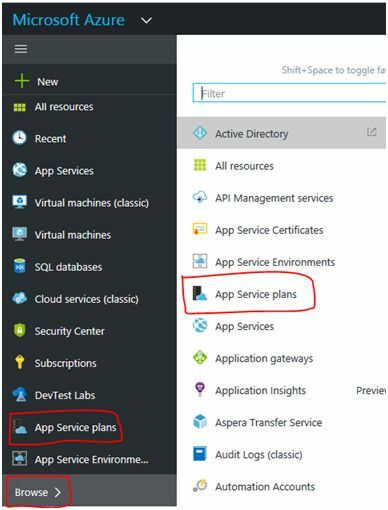 Navigate to Azure Management Portal and click on “App Service Plan”. 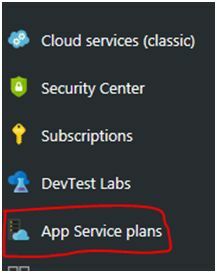 If you don’t see the “App Service Plans”, click on “Browse” and search for “App Service Plans” as shown below. The App Service Plans will list all the existing plans if you already have them. Now, click on “Add” button as shown in the above screen capture. You will be taken to the “App Service Plan” blade as shown in the below screen capture. Provide the required details and select an existing “Resource Group” or create a new Resource Group. In my case, I have created a new Resource Group. Please note that the App Service plan can be associated only with one Resource Group. 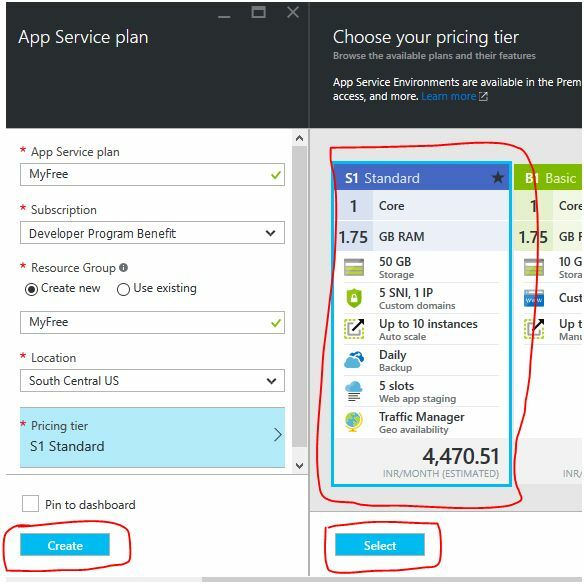 And, while creating the App Service Plan, we need to select the “Pricing Tier.” Click on the “Pricing Tier” link of the above screen capture and select “S1 Standard” as shown below. You can select the pricing tier based on your requirements. Click on “Select” in the “Choose your pricing tier” blade and then click on the “Create” button of the “App Service Tier” blade. That’s it. It will take few seconds to create the App Service Plan. Now, you can create App Services and associate the same to the App Service Plan that we have created. Other Important Points to note related to App Service Plans. An app in App Services can be associated with only one App Service plan at any given time. You want to have separate environments, one for Production and the other for Staging. You want to perform load testing on staging and don’t want to impact the production server. You want to have geo-replication of your App Service Web App by having two App Service Plans in two different geographic locations. Any App service can be associated with only one App Service Plan. In case it’s required, we can move App Service Apps from one App Service Plan to other App Service plan provided they are in the same Resource Group as well as the same Geographic region. Each service plan that you create could be in one of the following tiers. I have tried to create the summary of the different features provided by each of the tiers. Hope you enjoyed reading the article. Your feedback is much appreciated.